Some Jew of the Week highlights in honour of our recent 5th Birthday! This entry was posted in Arts & Entertainment, Business & Finance, Extraordinary Individuals, Law, Politics & Military, Science & Technology, Writers & Thinkers and tagged 20th Century Fox, Adam Sandler, Albert Ballin, Albert Einstein, Barbie, Barbra Streisand, Baskin Robbins, Ben & Jerry's, Benjamin Disraeli, Bernie Sanders, BitTorrent, Bob Kahn, Bram Cohen, Calvin Klein, Cellphone, Charles Lazarus, Chemotherapy, Condom, Cruise Ships, Dan Harkabi, Danone, David Blaine, David Copperfield, DKNY, Donna Karan, Dov Moran, Dunkin Donuts, Emil Jellinek, Emile Berliner, Estee Lauder, Goosebumps, Gramophone, Haim Saban, HAPAG, Harry Houdini, Hasbro, Howard Schultz, Internet, Isaac Carasso, Jerry Seinfeld, JJ Abrams, Julius Fromm, Laser, Leon Blum, Lise Meitner, Louis Brandeis, Marcus Samuel, Martin Cooper, Mattel, Mercedes, MGM, Michael Kors, Mila Kunis, Motorola, Paramount Pictures, Paul Ehrlich, Power Rangers, R.L. Stine, Ralph Baer, Ralph Lauren, Roman Abramovich, Ruth Dreifuss, Ruth Handler, Scarlet Johansson, Sergei Brin, Shell Oil, Starbucks, Syphilis Cure, Theodore Maiman, Toys R Us, USB, Warner Brothers on December 22, 2015 by Jew of the Week. Few people know that the Warner Brothers that brought you hundreds of great films (such as The Dark Knight and The Matrix trilogies) and amazing television programs (Bugs Bunny and the Looney Tunes) were Jewish immigrants from Poland. Their names were Hirsch Moshe, Avraham, Shmuel and Yakov. Struggling to make a living, the family moved to the U.S., then to Canada, then back to the U.S., at which point the father of the brothers adopted the name Warner, changing it from Wonsal. The brothers worked in various odd jobs – bowling alleys, bicycle shops, meat salesmen – until they finally pooled their earnings and invested in a film projector. They would travel across small mining towns and put on film screenings. Once they saved enough money, they opened a proper theatre in Pennsylvania. It was such a success that they could soon afford to open more than a dozen other theatres. During World War I, the brothers began experimenting with making their own films. In 1918, they officially opened Warner Brothers Studio in Hollywood, with their first popular film My Four Years in Germany. However, WB only made it big with their famous dog Rin Tin Tin, a German shepherd rescued by an American soldier. The dog became such a celebrity that WB signed Rin Tin Tin to star in films for $1000 per week – a great deal of money at the time. WB’s fame continued to rise, and by 1924 they were already the most successful independent studio in Hollywood. 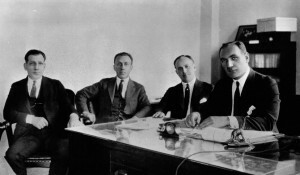 WB became a pioneer in motion pictures, and was the first studio to produce a “talking picture”, sparking the “talkie” revolution and changing the course of film. They would do this again in the 1930s, ushering in the “realistic” film period, as well as popularizing children’s cartoons. The success of Warner Brothers would continue to grow over the decades and their reach was extended to music (Warner Brothers Records), television (the WB Network) and even comic books (DC Entertainment). Thanks to the success of the Harry Potter films, WB became the first studio to gross over $2 billion domestically in just one year. They continue to produce hits and elevate film-making to new heights. – Hirsch “Harry” Warner, when first hearing of the talking picture. This entry was posted in Arts & Entertainment, Business & Finance and tagged are the warner brothers jewish, Canada, Film, Hollywood, Immigrants, Movies, Pennsylvania, Polish Jews, Rin Tin Tin, Warner Brothers, Warner Brothers Studio, World War I on March 7, 2013 by Jew of the Week.